Whats your blind? Need Help choosing the right blind for your room? We can help you choose the best blind suited to your decor then you'll cherish our window blinds. We can provide several beautiful plans in each shade, shading, surface and print. We at Impress Blinds provide Cheap window blinds in Leeds and surroundings gladly introduce the extensive variety of present vertical, roller, roman, velux, Venetian and wooden expressions. Our blinds designs are up to date with the latest disgns and patterns regularly updated. We have Fabric textures for all types of conditions from kitchen, bathroom,takeaways,hair salons etc we have a blind for every scenario. We just manage quality items and we generally incline toward our consumer loyalties. We also provide free measuring in the comfort of your home and fitting facility free of cost. currently our offers are 3 vertical blinds for just £79 along with 12 month warranty. Our window blinds are made in UK. Our accumulation incorporates an extensive variety of shades, prints and patterns to suit any size of window or home inside. So whether you are searching for window blinds for your kitchen or a fun-stuffed component print with a blackout texture for kid's room, we will make sure to locate the ideal window blinds for you. Our Blinds are manufactured and assembled in the UK with excellent quality. We give 12 month guarantee on all our window blinds. Presently you can get 3 vertical blinds for £79. 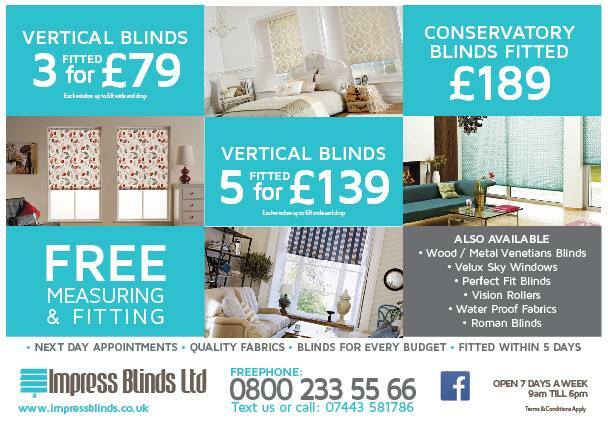 We offer a free measuring and fitting servicde to ensure that our window blinds look the way you would like. Pick a flawless edge for your windows from Impress Blinds today and change the look of your home.